Clark Atlanta University's Center for Career and Professional Development works to prepare and position you for internships and career opportunities, including enrollment in graduate and professional schools. We believe that you are smart, capable and strong. Let us help ensure that prospective employers and admissions counselors get to know you in the same, competitive light! Tomorrow is in YOUR hands. Let us help prepare you to put your future into the hands of global recruiters and educators. ﻿We are excited that you have chosen to recruited students from Clark Atlanta University. Hire a Panther CareerLink helps students find careers and internships in their degree field. By joining our FREE system, you will be able to post job/internship/co-op opportunities for our qualified students as well as schedule events and interviews on our campus. 1b. if your company DOES have a Handshake account click here. 2. Follow the easy to use prompts. 3. Click HERE for Handshake resources and information. Students should log into their CAU CareerLink to view job/internship/co-op opportunities. Students can click HERE to sign in using their regular CAU computer log in. An internship is an extension of your college learning experience. It occurs in the actual workplace where you are provided a "hands on" learning opportunity as your employer trains you in a real work atmosphere. Even though many internships do not offer salaries, the benefits of such participation are incalculable and will last you a lifetime. This type of experience is an excellent way to begin your chosen career path and to explore employment tracks that you may be considering. It also provides opportunities to put to practical use what you are learning in the classroom. Internships are unique opportunities to “test the waters.” Students may receive academic credit pending approval from their academic major department. 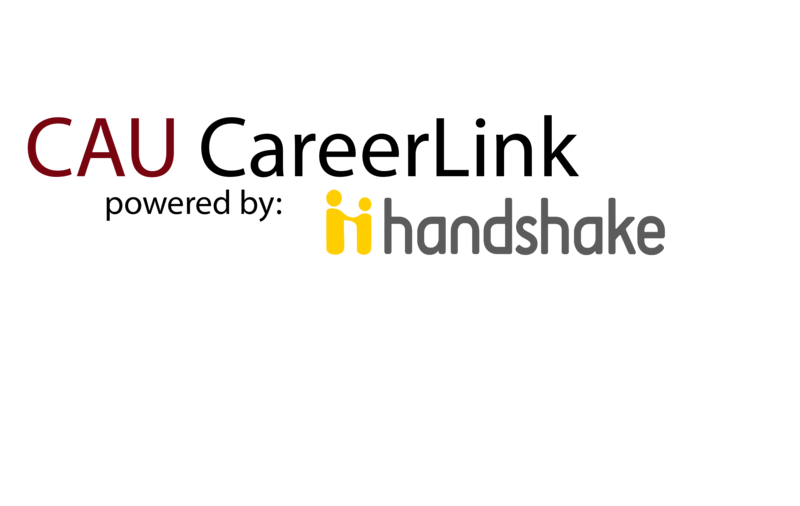 Handshake also serves as a database that allows employers to post job and internship listings directly to our site. All students must register in order to gain access to this database as well as to the services available through the Center. Further assistance with job search strategies and resources should be discussed with your respective career counselor or by enrolling in our workshop on Job Search Strategies. More assistance with internships may be provided by our in-house Internship Coordinator. The Cooperative Education Program (Co-op) at Clark Atlanta University is designed to provide students with the opportunity to test their chosen profession in “real time” by combining classroom instruction with supervised, paid career-related work experience. Participation in Cooperative Education can help students clarify their career interest and develop the critical workplace skills needed to ensure a successful career in the global market. The pieces of the career puzzle fit together through Cooperative Education and other experiential opportunities offered under the program such as Internships and Summer Research Experiences. Co-op and Internships provide valuable opportunities for continuous learning by linking students to the professional world where true career exploration, growth and professional development begins. Opportunity to explore career interest and gain valuable work experience that increases students’ clarity and marketability for potential employment. Aids in the development of leadership and professional development skills critical to workplace success. Earn money while learning that can offset tuition and incidental expenses. Cooperative Education and Internships are available to interested undergraduate and graduate students in good academic standing at Clark Atlanta University. Undergraduate students must have completed two semesters of study at CAU with a minimum cumulative GPA of 2.5 or higher. Graduate students must complete one semester and have a GPA of 3.0 or higher. The minimum GPA requirement for undergraduate students seeking an internship is 2.0. However, in some instances, employers may require a higher GPA for undergraduate students for some Co-op and Intern opportunities. Graduate students must have a GPA of 3.0 or higher. Academic credit may be awarded for Cooperative Education and Internship experiences. The amount of credit awarded varies from one academic department to another. To receive academic credit, students must seek advisement from their academic department and adhere to both the academic and university guidelines when registering for classes. All interested students must create an account in “HandShake,” a database for connecting CAU students with potential employers, schedule an appointment to meet and participate in a formal orientation, and submit additional supporting documents (signed Student Participation Agreement, resume and unofficial transcript). In addition, each student must attend a minimum of three (3) professional development seminars scheduled during the academic year. These dates are approximate beginning and ending work dates. They are based on the academic calendar of the university. If you have any questions please call the Career and Professional Development Office at (404) 880-6749. Request for change in start date or extension of work period must be approved by Co-op/ Internship Staff. Alternating - The student alternates between a semester of full-time study and a semester of full-time work. Parallel - The student combines periods of work and study during the same semester. Students on parallel co-op assignment work 20 hours per week and go to school full-time. Interns can be hired to work during the summers only or throughout the academic year. However, if an employer would like to hire a student as an intern during the academic year, the student should not work more than 20 hours a week. The student work schedule and salary for both co-op and interns is determined by the employer. If an adjustment to the student’s work schedule is needed, the student should meet with the employer for further discussion and follow-up with the CPD Office for approval. To recruit potential co-ops and interns employers have the option of conducting/scheduling Employer Information Sessions, In-Class Presentations, Mock Interviews or participating in scheduled Career Fairs held once in the fall and spring. On Campus: The campus interview allows recruiters to meet with CAU students using a prearranged schedule. Phone/Skype: The phone/Skype option is great to use as a prescreening process and for employers not interviewing from a prearranged schedule.